Does Magic Custard Cake rings a bell ? Oh ! 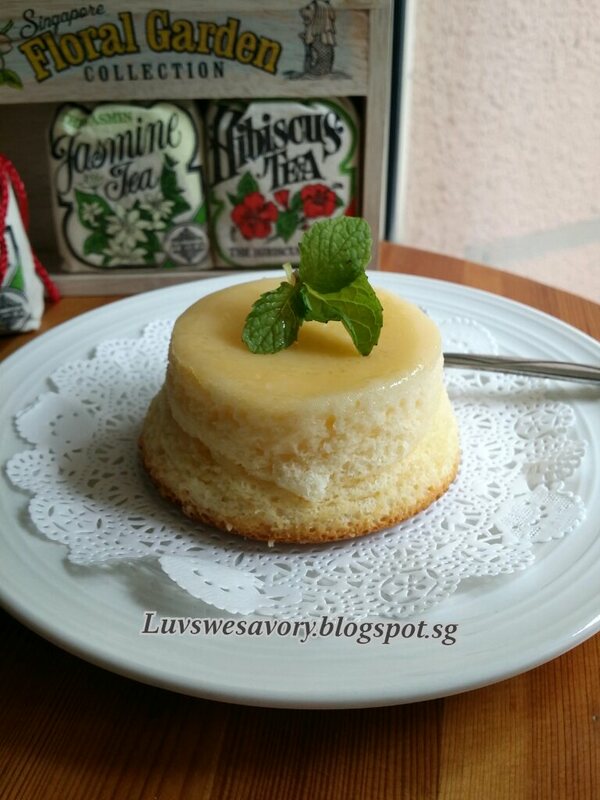 It was so popular a few years ago in blogosphere as we were fascinated with "one batter when baked, it separated into three layers: a cake layer on top, a custard layer in the middle and another dense custard layer on the bottom". I, too, baked the magic custard cake to join in the fun then. After awhile, I tried the chocolate version but the layers were not distinguished. As my big kids didn't like a big cake with too much "milky and kueh-like texture", hence, I did not attempt other flavour like coffee or pandan. Scouting for some cookbooks in the Library and "Dessert for Two" caught my eyes ... I like the idea of cookies, cakes and pies recipes just nice for 2 persons (Lazy me don't have to do my calculation to scale down the recipes ... hee.. hee!). A recipe 'Old Timey Pudding Cakes' by the author "like the magic custard cake one batter and during the baking process, it separates into 3 layers : a pudding, a cake and a slightly crunchy meringuelike crust." But these are just like Mini Lemon Pudding Cakes to me. 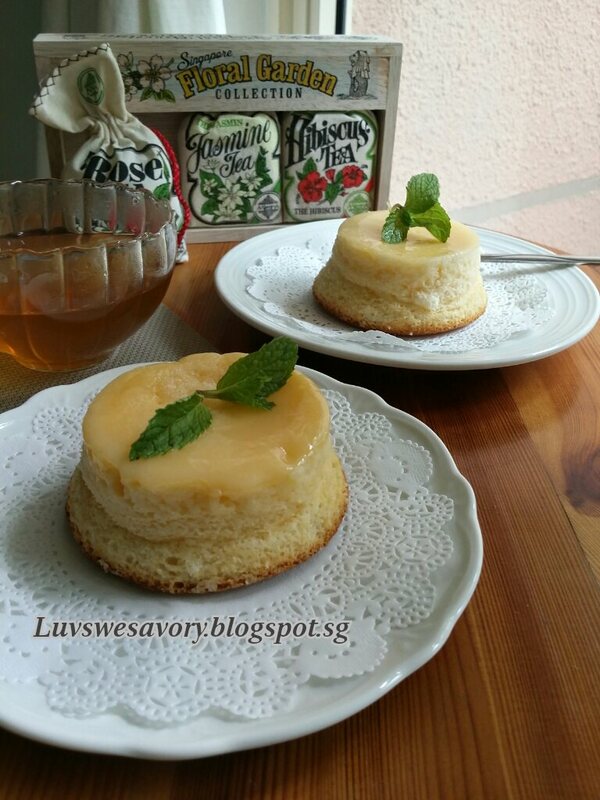 We love lemony citrus cakes and these mini cakes are just perfect for our after meal dessert. (need not keep any unfinished portion in the fridge). 1) Preheat the oven to 160°C and position the rack in the center. 2) Brush the ramekins with softened unsalted butter. Brush from bottom upwards. Then, coat the ramekins with caster sugar. And shake out any excess, set aside. 3) Separate the egg into yolk and white. (the size of my egg is 65g with shell). 4) Prepare water bath by filling an 8 or 9-inch square baking dish or pan with 2 cups of hot water or enough to come up about 1/2-inch on the sides of the ramekins. 5) In a clean small bowl, whisk the cold egg white and a pinch of salt (I used lemon juice) till foamy using the electric handheld or stand mixer. Beat till stiff peak, formed into a firm meringue. 6) In another bowl, beat together the egg yolk, caster sugar, milk, lemon zest and lemon juice with electric mixer on medium speed. Add the flour and mix until combined. 7) Gently but quickly fold the meringue into the yolk mixture with a spatula or manual whisk. Once the mixture is combined, pour it into the prepared ramekins. Fill about 90% full. 8) Bake for about 40 minutes. The cakes are done when the tops are lightly golden and spring back when touched. Tip the cakes out of the ramekins immediately, garnish with mint leave if you like and serve. While my big girl finds it a little too sweet but my big boy likes it. As for me, I enjoy it with a cuppa of rose tea! 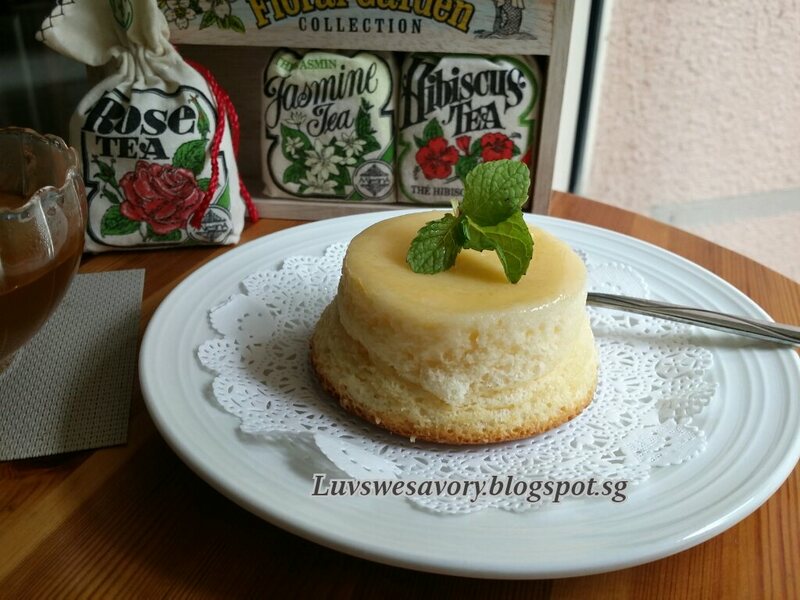 Happy baking and have a great week ahead ^-^! Your mini lemon pudding looks and sounds so good. Have a joyful day! Oh my goodness these lemon pudding cakes look delicious Karen, all 3 layers sound perfect. These look amazing, had me pining for some from yesterday! Aah..these look so delicious, Karen. Just the kind of cake I would love to have with tea and a book in hand.